Not Your Kid’s Hanukkah Countdown! L’Chaim! If you look around at all of the Advent calendars out there, there are just as many designed for adults as there are for kids. But, in the land of Hanukkah decor, it seems that most of the designers seem to think only little kids celebrate Hanukkah. So last year I decided to make my husband his very own Hanukkah Countdown for each night of Hanukkah. I’m back! Not sure where the time has gone but it’s been way too long since I’ve posted and I do apologize. If you’ve stuck around despite my absence, thank you ever so much! I can’t believe that November is here and that Hanukkah is right around the corner. It starts the evening of November 27th which means it is just over 3 weeks away! So time to start shopping and/or crafting some gifts! 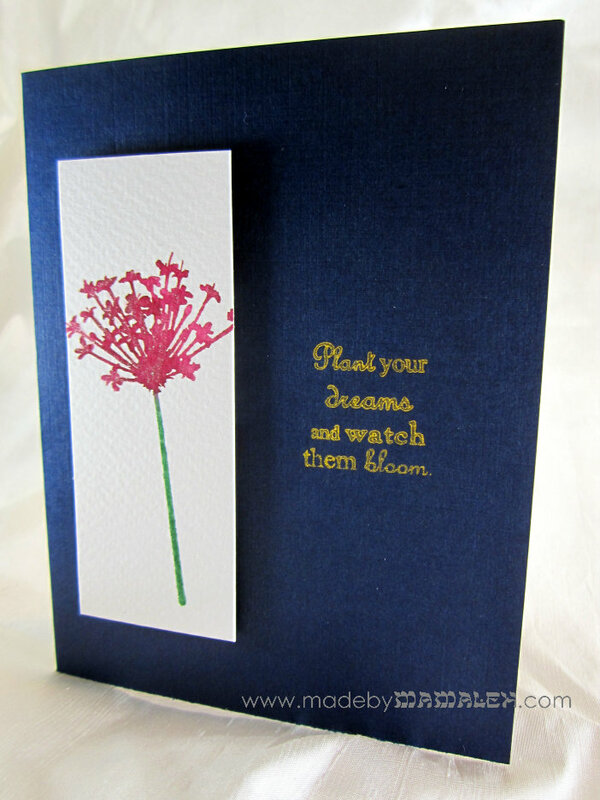 Today’s project is one that would be perfect for Hanukkah or really any gift-worthy occasion. It’s Time for A New Jewish Calendar, Again! I can’t believe that Rosh Hashanah starts the evening of September 4th! It’s coming up so quickly and I have so many projects still floating around in my head and we’ve been dealing with a bunch of, well, life. At least one thing I can take care of pretty easily is ordering my new Jewish calendar to help myself enter the new year organized! My yearly pick hasn’t changed from last year (shockingly) and will probably always be the Jewish Art Calendar by Mickie Caspi. You can see each piece of artwork featured on Caspi’s website. I LOVE Mickie Caspi. She sort of reminds me of a Jewish Mary Engelbreit in terms of the warmth and cheer of her art. We gave both sets of parents her parents’ gifts when we got married and her artwork is simply beautiful. I am super bummed that there is not an updated Sammy Spider kids’ Jewish calendar. We ordered one for my son last year and it has been fantastic with great monthly projects/stories. The only saving grace is that the 5773 version actually goes through the end of secular 2013 so I guess we can hold off but I am still bummed nonetheless. My Very Own Jewish Calendar is seemingly kid-friendly but it’s certainly no Sammy Spider. But, could be worth a try. The art featured in Jewish Celebrations: Paintings by Malcah Zeldis offers a lot of vibrant, family imagery that kids and adults alike would enjoy. If you need something a bit more portable or to keep on your desk, check out The Jewish Museum’s Jewish Engagement Calendar. I am contemplating this one for blog planning purposes especially. Another portable option seems to be the Executive Jewish Calendar but this doesn’t really look like it packs much pizzazz although maybe it’s great inside. Who knows? Has anyone tried it? Hope this helps you start to prepare for the new year just a little! You can always check out last year’s free printables if you want to get a jump on some super easy but sweet decorations to ring in the new year. Or check out what I think is the Best Honey Cake Recipe Ever! And stay tuned for more new year’s sweetness in the coming weeks! Welcome to Day 3 of A Very Jewish Summer! I know for many people summer evokes memories of Jewish summer camp and specifically sleep-away camp, your first adventure away from home. Growing up in Southern Oregon, I never got to experience Jewish summer camp but having gone to college 3,000 miles from home, I know firsthand how much care packages from home mean. My little one has a way to go before he heads off to camp by himself (though I am very excited we’ll be heading to Jewish family camp at the end of the summer!). 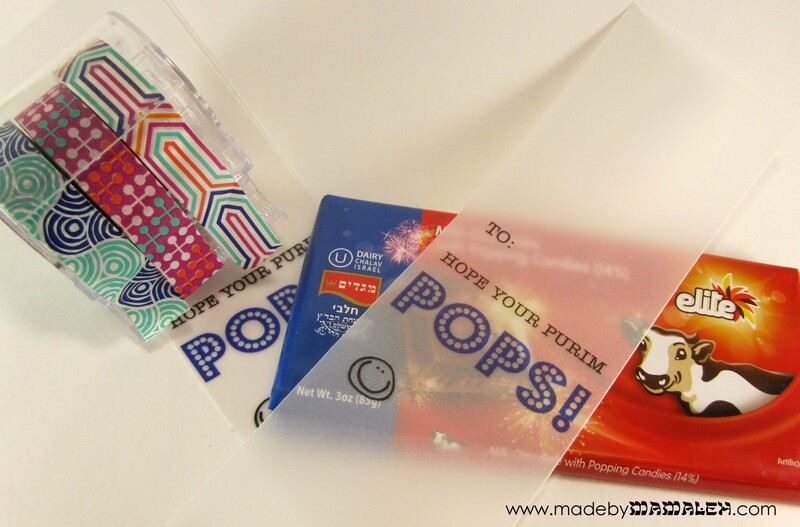 So, since I have several close friends whose kids will be at camp this year I decided to put together a combo of DIY and store-bought goodies to send them a little love from Mamaleh. 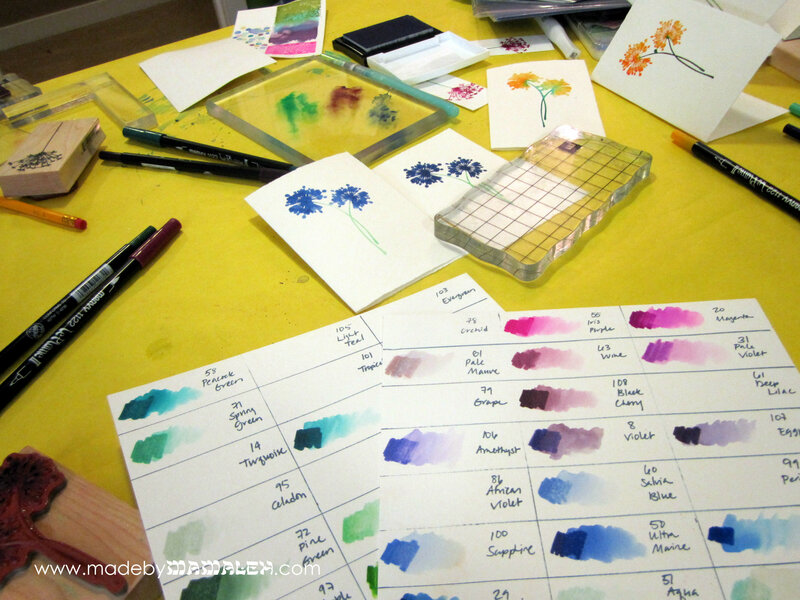 First, a little something to send some love back home (and maybe a thank you note to yours truly) : personalized stationery. 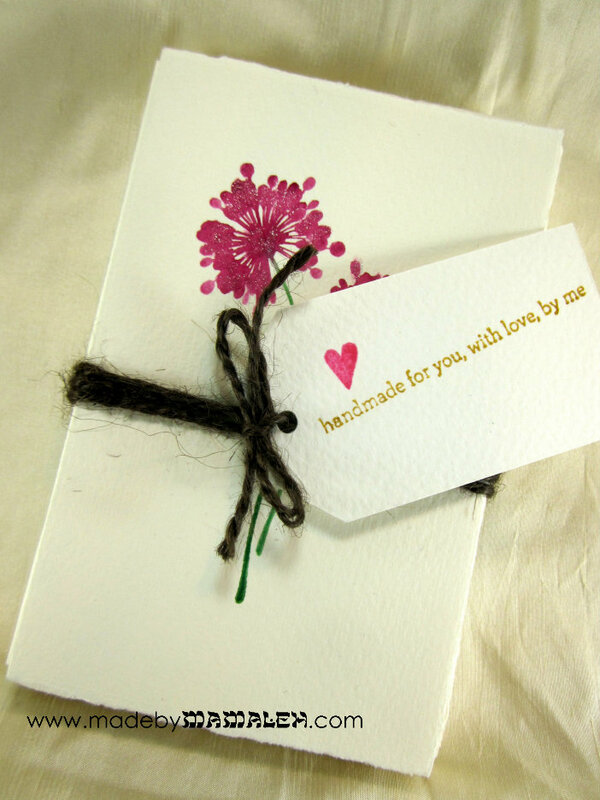 I realize we live in the era of email and text but I think there is nothing better than an old-fashioned letter or card. 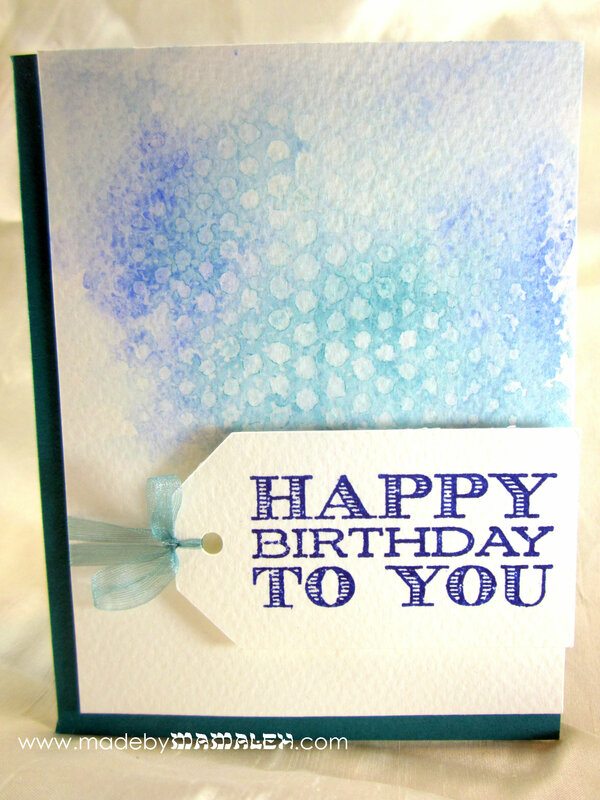 I decided to give this a Jewish twist by including both English and Hebrew names on the cards. Using Microsoft Publisher, I created my own custom A2 size (4.25″x5.5″) template and then created a text block at the top, inserting a little symbol in between the English and Hebrew. (If you need help using hebrew fonts on your computer, or are looking for some stylish ones, check out my earlier post on the subject.) Then I printed these out on a variety of nice cardstock and cut the cards (by making them A2 size, you get 4 cards per 8 1/2 by 11 sheet of cardstock). I even rounded the corners on some for a little something extra. 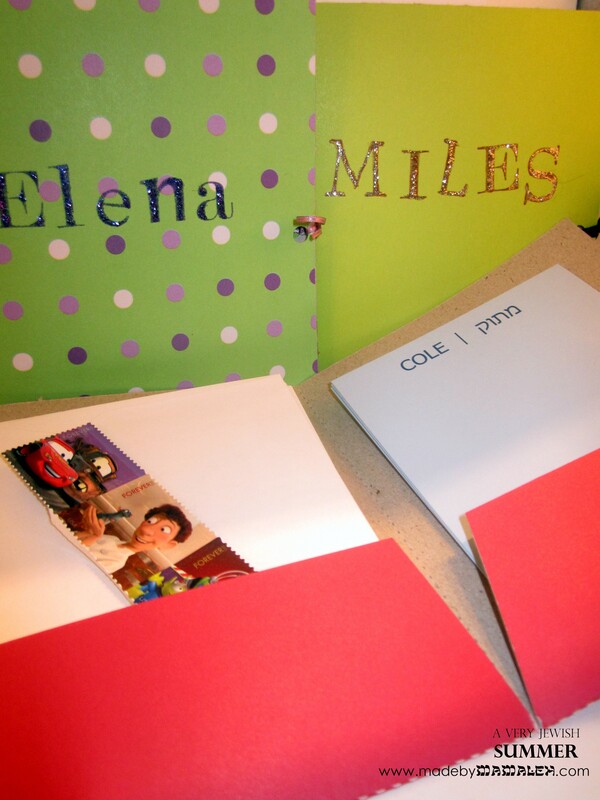 To finish off these sets, I paired them with basic A2 envelopes, cute kid-friendly stamps and matching little folders cut from this folder template using Silhouette Chipboard, layered with cardstock and then stamped and embellished with a little glitter glue. 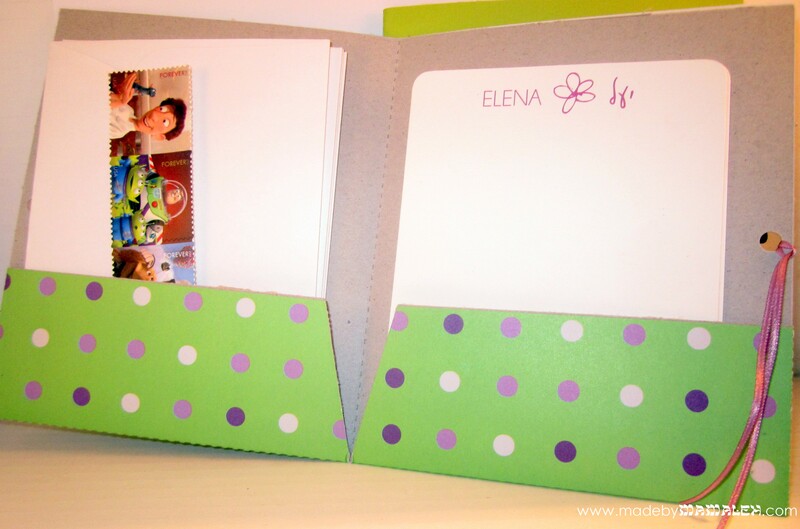 A tip for the folders – be sure to let the glue set after gluing down the tabs on the sides by putting some pressure on it – I used binder clips which worked really well to hold it in place until it dried. Last, I punched holes and tied them shut with a little piece of ribbon. 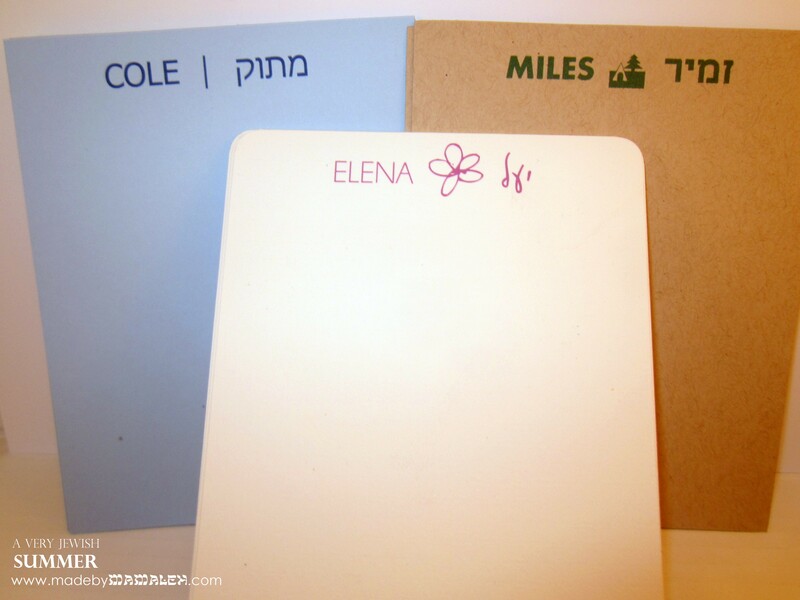 Besides personalized stationery, I had visions of glow-in-the-dark kippahs for Shabbat and Havdallah under the night sky. This proved a bit trickier than I’d envisioned. 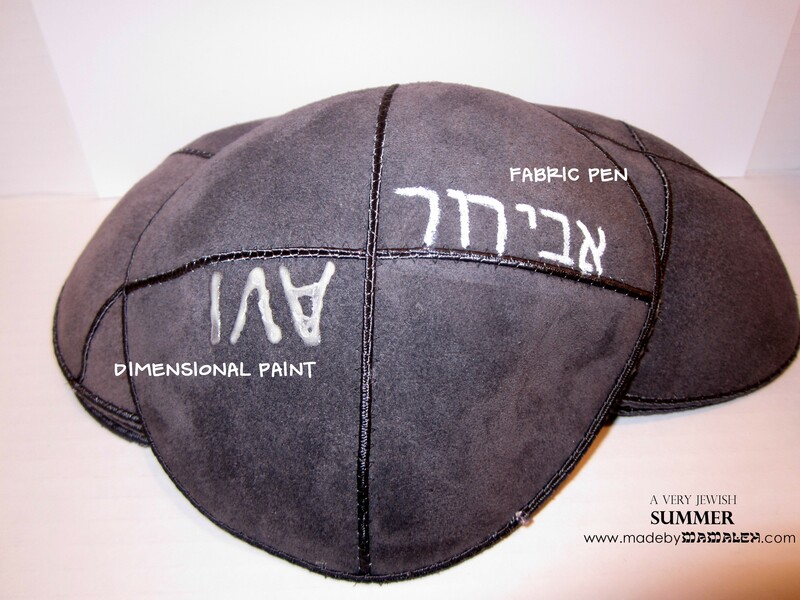 I started with some grey suede kippahs from bestkippah.com (I found this was one of the few places that allowed me to order a single dozen versus the several dozen often ordered for weddings and other mitzvahs). My original plan was to try some glow-in-the-dark heat transfer vinyl but it wouldn’t stick to the suede so using my Silhouette for something more intricate was out. The result isn’t exactly what I was hoping for but I think it’s still fun and I am planning to go back over some areas to fill them in a bit more. I know from experience that putting too thick a layer of dimensional paint can prevent it from properly drying so going back over it after it’s completely dry is definitely the way to go. 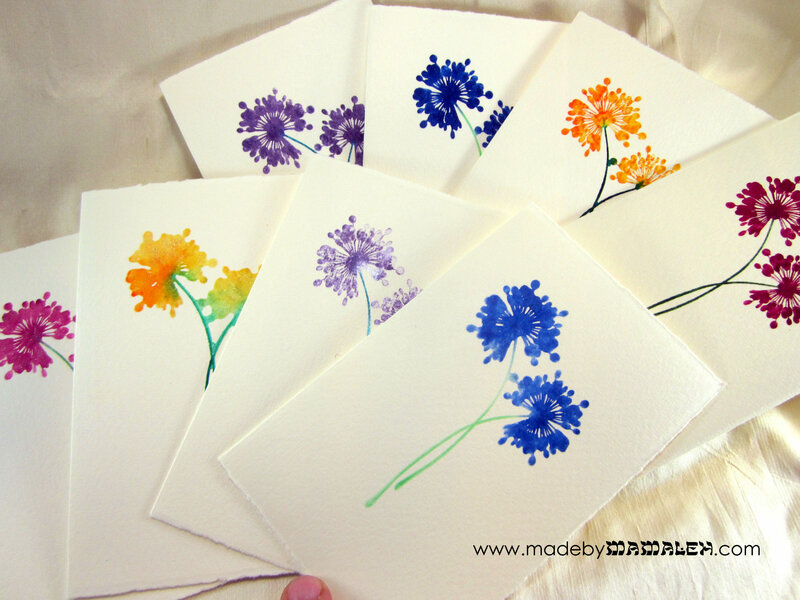 I also may keep my eye out for other colors of glow-paint to add a touch of color before I send these off. Most importantly though, they definitely glow in the dark (I tried to get a photo of this but it proved way too difficult), so hopefully they will be a hit with these kiddos! Mini Camp Bunk Box of Questions for some late night chit-chat fun; Girls World of Doodles – I must admit that I kinda wish I could keep this for myself just to spur my own creativity; Mr. Sketch Markers to use for doodling; Finger flashlights for late night reading or silliness, enough to share with the whole cabin; Mad Libs – these were one of my faves on long car trips so I figured they’d be great for camp as well: Lego Star Wars Mad Libs and Summer Fun Mad Libs Junior and finally the yiddish-named build-a-bagel card game Schmear which looks like a lot of fun! 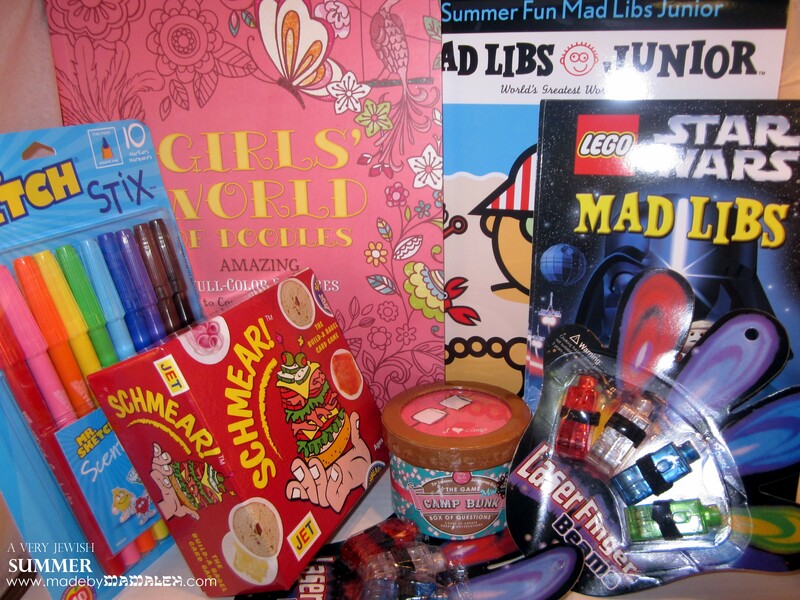 Hope I’ve inspired you to be crafty and creative with your summer camp care packages this year. If you aren’t feeling crafty or if you’re short on time, you can always opt to send one from somewhere that specializes in camp care packages like The Wrinkled Egg or Sealed With a Kiss. One final thought, be sure to check what your camp’s care package policies are before sending – most don’t allow food and as a result will open things that are not obvious, hence I am not doing any sort of wrapping. I can’t wait to pack up all of these goodies and send them off! What about you? Are you planning on sending any care packages this summer? What are you including? That wraps up Day 3 of a A Very Jewish Summer, hope you are enjoying the party so far! If you are just joining us for this blogging party, be sure to check out what you’ve missed so far – we started out with the lovely dinosaur cookies by Yenta Mamas for a prehistoric Shabbat treat followed by a lovely Shabbat Alfresco tablescape by Chai & Home and tomorrow we’ll be treated to a yummy recipe from Busy in Brooklyn. So stay tuned as a Very Jewish Summer continues! Oy! Passover is less than a month away and I still haven’t recovered from all of our Purim fun just yet (and to add to that I have spent the day with a sick kid shuttling between doc and pharmacies). 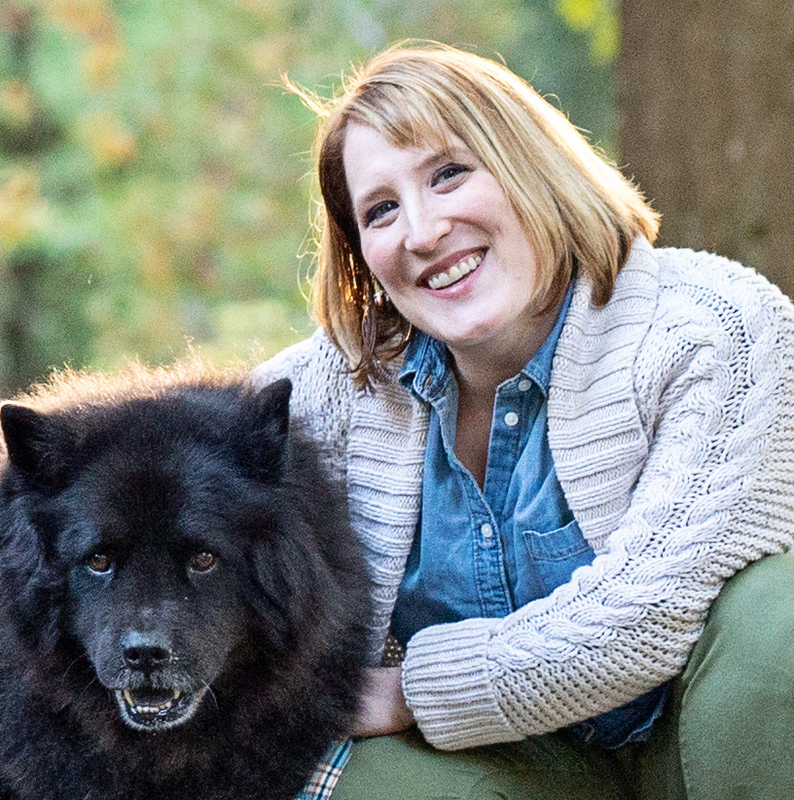 I can’t even pull it together to give you a little Purim costume recap/crafty info today (but for a quick preview check out my new FB profile pic. You have until 11:59 PM PST on Wednesday March 6th to enter. Winner will be drawn at random. Giveaway is only open to U.S. residents. Good luck! In the meantime, if you need some kid-friendly Passover ideas to start your Passover planning, check out last year’s A Very Toddler Passover. 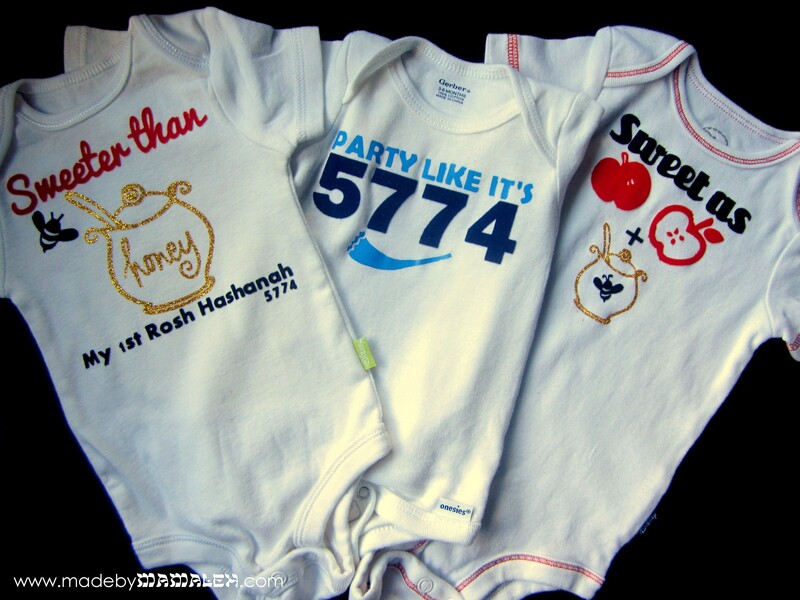 It’s time for Purim and we are really celebrating in our house this year! We are kicking off things off with my son’s preschool parade (he goes to the JCC) today, then we’ve got our synagogue megillah reading (complete with super-hero theme) Saturday night and finally to top it all off our big temple carnival on Sunday! I have one very excited 3 1/2 year old boy who’s been gearing up all week working on a grogger, hamantaschen and mishloach manot. Now, as you know from my previous posts, I don’t have an issue with Jews choosing to celebrate Valentine’s Day and I myself love it. But, I will admit that I was a bit surprised to find so many valentines in my child’s cubby at the JCC since the past couple of years it hasn’t really made an appearance and isn’t something the school recognizes. I suspect this year’s increase was a combination of older sibs in public school, keeping up with peers and just a general desire to celebrate. 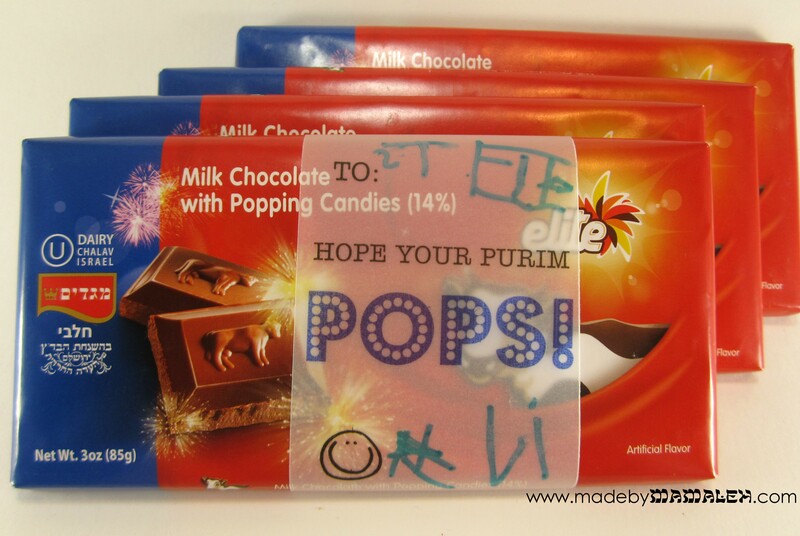 So, I decided that rather than join this trend, we’d give everyone a little something for Purim since, after all, it’s one of the holiday’s mitzvot to give gifts of food to friends. Technically, the idea is to give food so that everyone has enough for a Purim feast but in essence, the idea is to share love and harmony and we are talking preschoolers here. So, I decided to come up with my own mini mishloach manot (think class valentines meet Purim) that we could put in everyone’s cubby. Now, I realize hamantaschen are the traditional Purim food and I do love me some tasty hamantaschen – for my fave recipe, check out Martha’s hamantaschen dough and add your favorite jams, lemon curd or cherry pie filling. But, for this project I decided on bright, cheerful mini Unicorn pops. 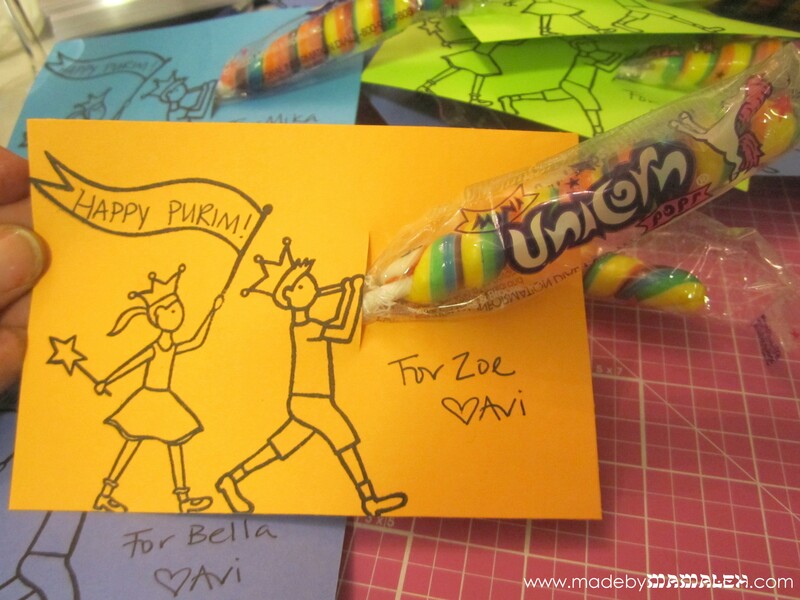 A while ago, I bought this great clear set from Amuse Art Stamps that just said Purim parade to me (note: the line is now discontinued, sorry). 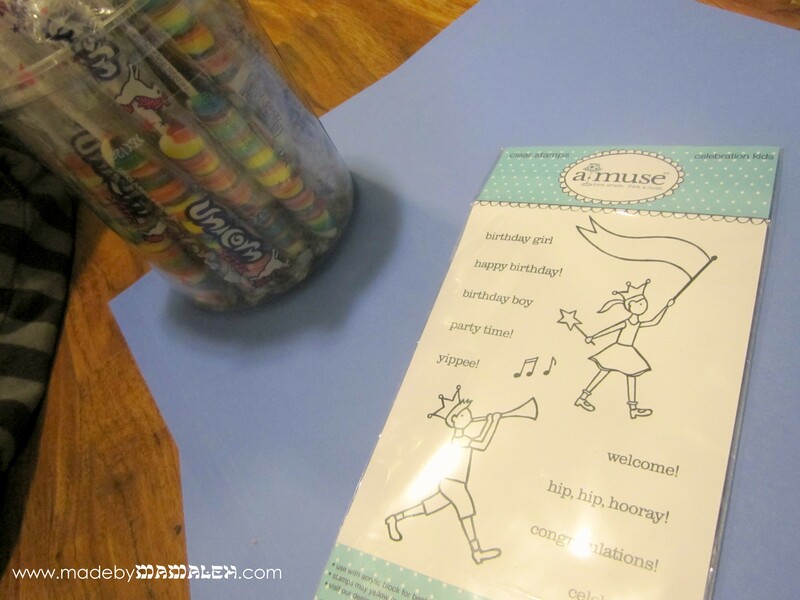 I used these stamped simply in black ink on a variety of 3 1/2 x5 colored cardstock, wrote “Happy Purim!”, made a slit with my Exacto and then taped the lollipop to the card, making it look like the noisemaker being sounded by the little boy. 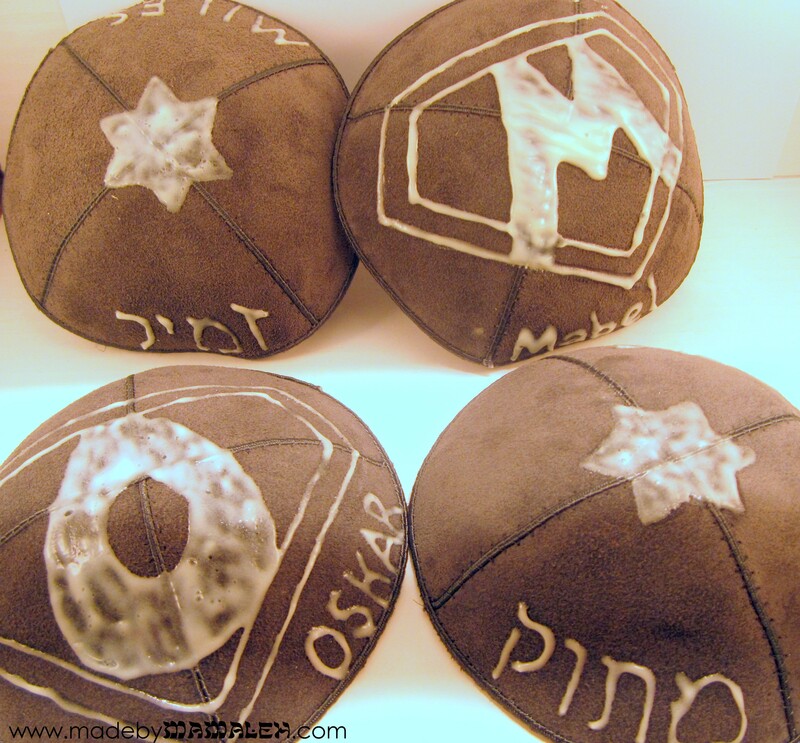 The perfect mini preschool mishloach manot! 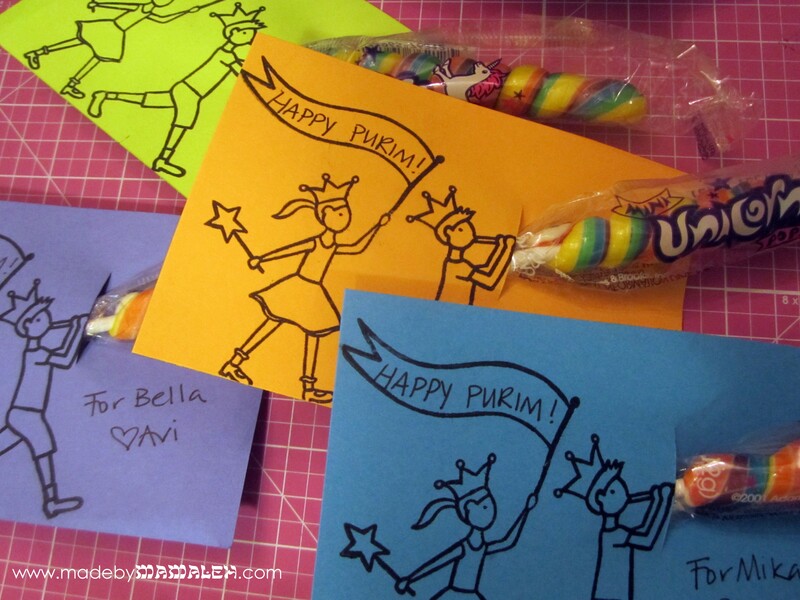 Happy Purim!